Overconfidence is one of the most powerful cognitive biases that affects KM. Here is how to address it. Cognitive biases are the plague of Knowledge Management. They cause people to neglect evidence, to fail to notice things, to reinvent their memory, and to be overconfident about their own knowledge. 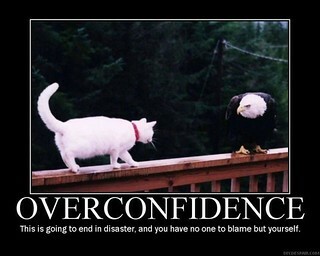 Overconfidence in particular is an enemy of learning. People are more willing to accept knowledge from a confident person, but confidence is more often linked to a lack of knowledge - the "Dunning-Kruger effect". Overconfidence leads to wishful thinking, which leads to ignoring knowledge from others, and is one of the primary causes of project cost and time overruns. Overconfidence is therefore what happens when you don't know what you don't know, and a recent Insead study shows that overconfidence can be significantly reduced just by considering your lack of knowledge. In this study they gave people general knowledge questions, and found (as is often the case) that people were overconfident about their answer (You can take a similar test, to test your own level of overconfidence). Then they tried again with two groups of people - with the first group they asked the people to list a couple of missing pieces of knowledge which would help them guess the answer better, and with the second group they asked them to consider reasons why their choice might be wrong (a "devil's advocate" approach). In our view, overconfidence often arises when people neglect to consider the information they lack. Our suggestion for managers is simple. When judging the likelihood of an event, take a pen and paper and ask yourself: “What is it that I don’t know?” Even if you don’t write out a list, the mere act of mulling the unknowns can be useful. And too few people do it. Often, they are afraid to appear ignorant and to be penalised for it. But any organisation that allows managerial overconfidence to run amok can expect to pay a hefty price, sooner or later. In Knowledge Management, we have a simple and powerful process that allows exactly this process of "Considering the unknowns". This is the Knowledge Gap Analysis, or its more elaborate version for larger projects - the Knowledge Management Plan. Both of these processes require a team to list the things they do not know (thus reducing overconfidence) and then set up learning actions to acquire the knowledge (thus reducing the number of unknowns). These are two of many KM techniques that can help address cognitive bias.